Of this popular entertainer of America. With levity and nonsense for all. 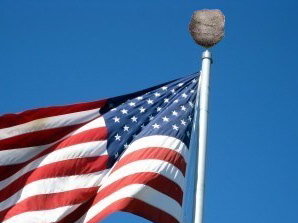 And since it's still Gimmick Month, I'll offer this photo as further proof of the deep, meaningful connection between the gum and Old Glory. I'm either going to be in the next Whitney Biennial or sent to Gitmo. Political and military realities trump wishful thinking. That's why both Gitmo and CelebriGum remain in operation. FUN FACT: There were only 13 wads of old gum stuck to the "Betsy Ross" flag. It was a symbolic response to the Crown's hated Gum Tax.